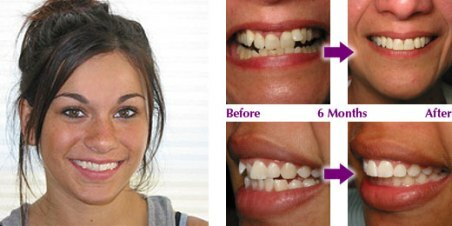 How can Six Month Smiles be done in just 6 months? Dr. Briggs' technique utilises the latest techniques and technology to move your teeth quickly and safely. The key component is the use of special Nickel Titanium wires. Will I have a mouth full of Metal for 6 months? No. Dr. Briggs uses tooth colored brackets. People will hardly notice that you are wearing braces. Are 6 Month Smile braces more painful than regular braces? No. 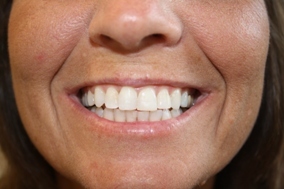 The 6 Month Smile braces technique uses LOW force to move the teeth comfortably. Many people think we "tighten" the braces excessively to get the teeth moving. This would actually slow down tooth movement. 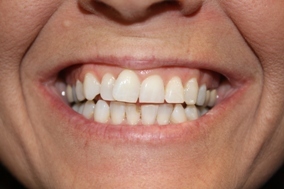 Does the 6 Month Smile braces technique damage the teeth, roots, or gums in any way? No. The 6 Month Smile braces technique uses LOW force with short treatment duration to safely move the teeth. Do Six Month Smile braces cost more than regular braces? Yes, as with any orthodontic procedure a retainer is necessary. If you do not want to wear a retainer very long you can have your teeth splinted together. There are a variety of options based on your preference.